BrickLink have just released their new site facelift, and part of that includes several APIs designed in conjunction with Rebrickable. This has enabled some great new features, such as the ability to automate shopping cart population, and improved exports and imports. The Buy Parts box is still found in the usual places (i.e. nearly everywhere there is a list of parts! ), but works a little differently now. The search will include every BrickLink store that has elected to be included in the search (which defaults to all of them). This gives thousands more stores than were previously available for searching. Only stores that ship to your country will be listed. As a result of #1, it is now far more likely to find a store that has 100% of the parts you are looking for. These stores are now highlighted so they stand out. The new functionality provided by BrickLink now allows for automatic adding of parts to the store's shopping cart. The Multi-Buy link can be used to help you buy parts from multiple stores simultaneously, and has been completely rebuilt. More details below. 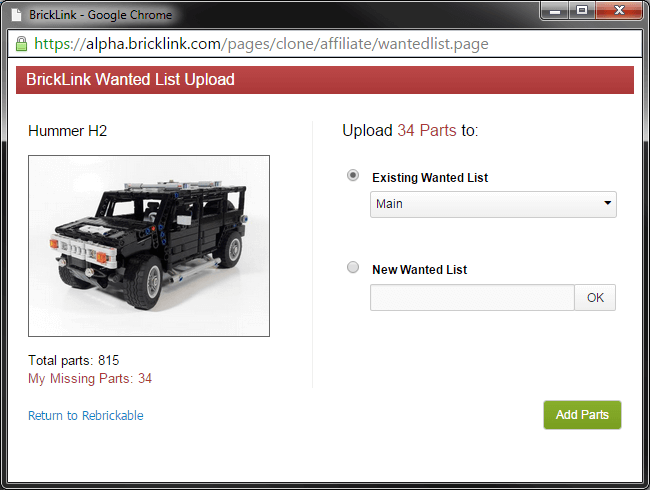 You can now automatically add parts to your BrickLink Wanted Lists, or create a new list. No more copying/hacking/pasting of XML code! You can also now add parts to your BrickOwl Wishlists. I also tweaked the ordering of stores (and fixed some bugs!). It will order stores by #lots, then #parts, then lowest price (after currency conversion). You should see all parts listed in your local currency, but the store's themselves may require payment in a different currency. This integration is now FREE for all BrickLink stores. The cost of listing your store on Rebrickable is now covered by BrickLink as a company instead of the individual stores. You can read more at BrickLink's announcement. This means there are now thousands more stores available for Rebrickable to search through while calculating the best prices and combinations of stores to buy your parts from. Note that you may have to enable popups for Rebrickable in your browser before you see anything. Click on the Add to Cart link in the Buy Parts table or the Multi-Buy page. A new tab will open and take you to your shopping cart for that store, with the parts already added. A tad easier than the old method! Note that if you already had items in the store's shopping cart from a previous session they may still be there and merged with this new session. The Rebrickable calculations do not take into account any possible minimum-buy amounts on the BrickLink stores, or delivery costs. But once you have added the parts to your cart, you are free to modify it before checkout. On your My Parts page, there is a new option - Import from BrickLink Orders/Inv (Web API). After clicking the Import link and logging into BrickLink, a list of all your orders will be displayed. Select one or more of them and click the Replace or Append buttons which will replace or append to the Rebrickable Parts List you had open when you started the import process. You can now automatically export a list of parts to an existing or newly created BrickLink Wanted List. 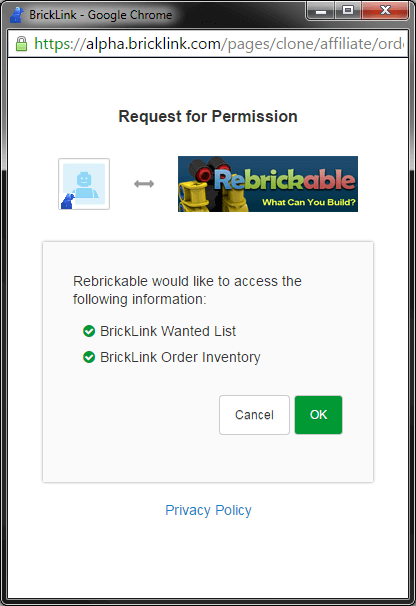 Click the link to Add to your BrickLink Wanted List and login when prompted. You will see a page similar to the one below - the image/text will vary depending on which Rebrickable page you came from. Pick an existing Wanted List from the drop down, or enter the name for a new one and click OK. Then click the Add Parts button to export the list of parts to the selected BrickLink Wanted List. A link will appear afterwards to direct you to the relevant page on BrickLink. You can also export a list of parts to one of your BrickOwl Wishlists or create a new one. Click the Add to your BrickOwl Wishlist link. If you have used BrickOwl imports/exports before, your BrickOwl API will be defaulted and just click the Get My Wishlists button to continue. If you don't have an API, go to your BrickOwl account and create one. Select a Wishlist and click the Add button. Alternatively, enter the name of a new wishlist to be created during the export process. A link will appear afterwards to direct you to the relevant page on BrickOwl. Set your filter options, the defaults are a good start. If you have a strong preference you might want to only include certain types of stores. Click the Recalculate button to search through the thousands of BrickLink/BrickOwl/Custom stores and find the top ones that match your criteria. By default, it will automatically select the most appropriate parts for each store based on the method you chose in the filter form. You can change the allocation by selecting the cells as appropriate. Once you are happy with the allocation of parts across stores, you can use the various Export/Cart links. 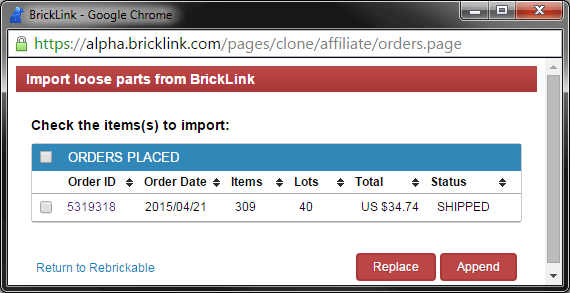 The BrickLink stores now provide automatic Shopping Cart population links that work the same way as described above. Rebrickable earns revenue from listing and enabling these purchases of LEGO parts at BrickLink and BrickOwl. We rely on this revenue stream to keep the servers running (and my LEGO habit fed!). You can show your support of Rebrickable by buying parts via our links. Why buy your parts via Rebrickable? If you have to ask, I assume you haven't made full use of this site's functionality! I like to think that Rebrickable adds considerable value to your LEGO buying experience by providing a FREE set of tools to make your life easier. Dear Nathan, don't if this is the right place to tell you this, but it seems no longer possible to import loose parts from bricklink via the web api. The pop-up shows an error? Caused by the renewal off bricklink? This was posted as a bug in the rebrickable Forum. Nathan responded that it doesn't appear to be a problem from the rebrickable end, probably caused by bricklink. I really wanted to like this multi-buy feature but on my first run it hit it's part to store limit and requested I limit the number of stores. If this were upgraded to handle much larger lists than it does it would be a very useful tool. You are at least heading in the right direction. Yeah, I've been running into memory issues now that there are so many BrickLink stores in the search. I hope to figure out a way around it soon. I hope you do. As soon as it can handle the lists I'm considering running through it I'll be spending thousands of dollars a month on results it spits out. As a side note it seems to me you would have great luck extending this into a downloadable desktop app that we could utilize locally. I would think that could alleviate some of your server load while allowing us to get quicker results (at least in my case if it used my 32 cores or $2k gpu) and you to still get your commission fees for the sales. I do really like your app though. You've done a great job with it, and it seems you've put more thought into it than the other similar apps I've tried, about 6 now. I'll be keeping an eye out for the update that allows for larger lists to be fully searched. Yes good idea, I will add this shortly. There are also some other options I will add soon once some BrickLink API changes have been made. This is a great feature, I don't do a lot of set building so I do a LOT of BrickLinking and this will come in very handy. The one thing that doesn't seem to come into play is the origin country. Is there a way to set the cheapest 'X' number of stores within "USA/Canada" or "Europe". Sometimes the parts might be a little more expensive in your home country but still cheaper than buying overseas + shipping. I know you can't calculate shipping but it would be easy for a user to eyeball the difference between sourcing domestically vs. international. Excellent job as it is though, this will prove to be a very useful tool. I plan on telling my LUG about it at the next meeting. Yes, I think I will add some extra options/filters to do that. So, what exactly do I have to do to give you commission? I generally export to a wanted list, then leave it for a few weeks or months until it has enough parts to justify international shipping. In general, if you can add to cart and buy in a single session that makes referrals far easier to track. The same goes with Amazon/eBay/LEGO set sales. Oh boy :D This sounds so good. Too bad I just had a BL run over a week ago. But I will try to add the BL orders to my inventory. Thats VERY useful! Thanks Nathan. Your effort is super-appreciated! one question: if a shop shows like 95% of parts available, is there a way to see the missing 5% of parts ? Currently only by using Multi-Buy to save the parts from that store to a file and then import into a Parts List to run another build with; or buying from them and importing your order! It's something I've wanted to do for a while, just haven't come up with a good solution for it. Sorry I don't understand. You mean you'd like to always filter out specific stores? Is that a feature on BrickLink? Stores can stop list buyer without reasons on BL. (if your active on the forums your bound to collect many of these just by saying something store owner X doesn't like, mostly americans who don't like the european view of seller responsibilities) and since all stores have different store terms you least favor stores who charge a lot of the costs outside the brick price such as price per lot, handling fees or simply have terrible service and bad feedback. The last I can technically order from but the first is going to reject the user from entering the store and add something to the cart. 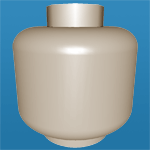 I usually also restrict myself to stores within EU, so a way to get that filter here on rebrickable would be good aswell. OK, sounds reasonable. I'll see what I can do. This feature is great but it seems that it replaced another feature that I like on Rebrickable. I can't easily find that parts I have been missing anymore. The missing parts list is gone for most if not all sets and mocs. It is definitely still there. Can you email me ([email protected]) an example of what you are seeing to make sure we're talking about the same thing.